at the Kuala Lumpur Convention Centre. China Banking Corporation (China Bank) was recognized as one of the best in the region in corporate governance, bagging awards in the Top 50 ASEAN Publicly Listed Companies (PLCs) category and in the Top 3 PLCs in the Philippines category. 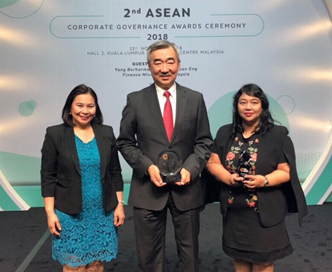 The prestigious awards, conferred by the ASEAN Capital Markets Forum at the 2nd ASEAN Corporate Governance (CG) Awards ceremony last November 21 in Kuala Lumpur, Malaysia, affirms China Bank’s commitment to corporate governance excellence to create shared value for all stakeholders. SM Prime Holdings Inc. (SMPH) and SM Investments Corporation (SMIC) also received awards in both categories, bringing the SM Group’s wins at the ASEAN CG Awards to seven. “Corporate Governance is a cornerstone of our success and sustainability. We have always been committed to elevating the level of our corporate governance, benchmarking our practices against international standards. I am grateful to the whole China Bank team for their firm adherence to good governance principles in their everyday work,” said China Bank Chairman Hans T. Sy. The bank was vetted among the PLCs of Indonesia, Malaysia, Philippines, Singapore, Thailand, and Vietnam using the ASEAN Corporate Governance Scorecard (ACGS) which articulates the good governance principles of the Organization for Economic Cooperation and Development. China Bank ranked among the top 11 to 30 among the top 50 PLCs in ASEAN, along with SMIC, while SMPH ranked among the top 10. SMPH got the Top Country Governance award, followed by China Bank and SMIC. SMIC also won the Most Improved PLC award. China Bank has been recognized by leading organizations in the Philippines and abroad for its outstanding CG practices. The Institute of Corporate Directors recently named China Bank as one of the Top 10 PLCs in the Philippines—the only bank among the awardees with over 100 points in the ACGS. Since 2013, the bank has been consistently in the list of top 50 Philippine PLCs evaluated under the ACGS. The Philippine Stock Exchange awarded the bank for its governance excellence for six straight years. UK publication Global Banking and Finance Review also named China Bank as the Best Bank for Corporate Governance Philippines 2018.